Set your event under the brightest lights with professional event lighting rental solution from one of the leading lighting companies in Dubai today – TriTec AV. TriTec AV is a full events solution provider offering audio visual rental packages to clients across Dubai and the UAE. We deliver customised AV rental solutions that are designed to meet the specific lighting and audio needs of our clients for their events. Our company boasts of more than 25 years of combined experience in the events industry, handling every kind of event imaginable, from major concerts, tours, and music festivals to intimate parties and corporate galas. We combine ambition, creativity, experience, and technical ingenuity to give our customers exactly what they need, at a price that works within their budget. With our lighting rental packages, we can turn any venue into what you want it to be – from a magical music wonderland to a dreamy and romantic setting. We have a team of lighting engineers and designers who can set up your lights to create the prefect mood and ambiance to suit your event. From moving strobes and laser lights to stage lighting and LED walls, we can lend a wide range of lights for virtually any situation. NOT SURE WHAT YOU NEED FOR LIGHTING RENTAL? We can provide you with a detailed consultation covering everything you need to create the best possible atmosphere for your event. Our consultants can sit down with you, discuss the nature and size of your event, and recommend a fully-tailored package consisting of all the lighting equipment and technology to get the celebratory look and feel that you want. So what are you waiting for? 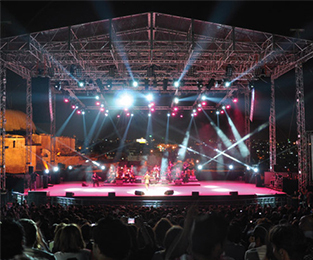 Partner with one of the top events and stage lighting companies in Dubai and UAE today – TriTec AV.